All Russian war veterans will be able to use the St. Petersburg metro system free of charge on May 8 and 9 during celebrations of the 66th anniversary of the country’s victory in World War II. Metro rides will be free not only for the city’s veterans, but also for veterans from other regions of the country, the St. Petersburg Metropolitan company said. One person accompanying a veteran will also be able to travel by metro for free. 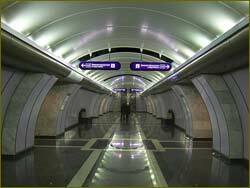 To enter the metro free of charge, veterans will have to show documents proving that they served in the war. City news archive for 06 May' 2011. City news archive for May' 2011. City news archive for 2011 year.